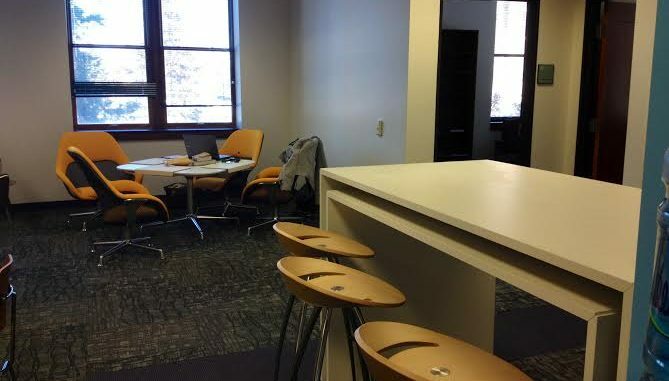 In order to provide a more cohesive space and to demonstrate its sincere dedication to career development, the Albion College Career and Internship Center underwent major cosmetic changes over winter break. The layout of the space changed drastically. Now, the Center for Teaching and Learning has its own location within the office. However, the interview rooms stayed put. But the Center longed for a way to draw more students into the office. “A big draw will be our coffee bar and café seating where we encourage students, staff and faculty to come and have discussions and network,” said Dawn Hernandez, assistant director of the Career and Internship Center. The renovations make for a more modern feel and open environment conducive to collaboration among students, staff, alumni and professionals. The furniture, walls and technology add to the office’s new, modern vibe. The administration’s goal for the investment was to show its commitment to the services provided by the Career and Internship Center to current and prospective students. Over the summer of 2013, Dawn Hernandez was promoted to assistant director and Jenny Risner-Wade joined the team as the operations manager. The Career and Internship Center is not planning on stopping here. The plans are in the works for the Ludington Career and Internship Center in Albion College’s library, but there is currently no set timeline. “It is unlikely that this will happen soon, as the college is still raising money for this renovation and then the renovation must take place itself, so it is likely that it will be three to seven years before this transition takes place,” Jeffery said. Once the remaining funds are raised, more headway can be made on the center. The Ludington Career and Internship Center will reside in the basement of the Stockwell side of the library. All of the new furniture will move with the current Career and Internship Center staff to that location. The most recent changes are geared toward the final destination of the library. “The Career and Internship Center will eventually move to the Library and these changes will help us to better understand the changes and design that we will be implementing with that change,” said Troy Kase, director of the Career and Internship Center. The staff stresses that its purpose and goal remains the same. Whether it be helping alumni find students to hire or help students find a career and employers to hire, the Career and Internship Center aims to help.